I managed to read this one in four days, something of a miracle considering my current reading load and how the rest of my life is going (School, mostly.). The book starts off talking about farts, something that almost put me off immediately. I enjoy funny books, and I know that humor sometimes gets crude, but potty humor is, for some reason, something I nearly always find disgusting. Thankfully, this type of humor worked perfectly into the plot, and made sense. It also was not a large part of the rest of the novel. That’s not to say the rest of the book wasn’t funny. I haven’t read a book this hilarious since Sanderson’s Alcatraz series. Many of the plot points and ideas–even the alien species and the religions–in the book seem ridiculous and crazy at first glance, and I found myself laughing throughout. But Scalzi also managed to do something here that I’ve never seen done before quite so well: he blended the ridiculous levels of humor and insanity into a coherent plot, where every part, every rambling explanation of how a man wrote prophesies as poems to get money from an old lady, and inadvertently founded a church (Uh, yeah. That happened. ), and makes it not only make sense, but also play a critical role in what happens in the plot. I was continually astonished by the way he did that in this novel; every time he went off to explain some new and crazy idea, I expected it to be just put there to be silly. I was wrong every single time, and it made me happy, every single time. The plot itself was gripping. It follows a rather interesting and shady bunch of people across the galaxy. Many of them are brilliant at what they do, some are simply despicable. My favorite is, hands down, Harry Creek. He is, in many ways, everything I wish I could be. A talented programmer, a brilliant soldier, and a genuinely good guy, who’s just trying to do what he can to save the human race from complete annihilation at the hands of a race of aliens who want… A sheep. Two of the main characters, Harry and Archie, are both very good with computers, and technology plays a critical role at several points in the plot of the novel. I’ve read plenty of books before where the computer science side of things was handled with a hand-wave or a few fancy tech buzz-words. Not here. This is the real deal. Scalzi knows what he’s talking about when he talks about computers and how they work. I’m a second year computer science student, and I’m not sure that I could write those portions of the novel as accurately as he did, but I definitely know enough to know that he wrote them correctly. I’m not sure if he is that knowledgeable himself, or if he called in an expert to help him (Sanderson has said, for example, that he did something of the sort with the medical scenes in The Way of Kings. ), but the end result is excellent. I want to thank Scalzi for the attention to detail, and I wish more authors would do this. The plot of the novel itself is never forgotten for more than a few pages, and the pacing is excellent. In a novel that could easily become sidetracked in the richness and humor of the universe, Scalzi manages to focus on the single central plot, and I was very impressed and never bored with the book. I finished it in four days, and it did not feel like I was rushing. In fact, I usually put it down at 3 AM, wishing I could read more, but knowing I had to get up and do other things the next day. This novel is a stand-alone, and it shows. At times, I think I forget how satisfying a good stand-alone novel can be, lost in the glory of Randland and Westeros, the Cosmere and Temerant (Kudos if you know them all.). I’ve loved other stand-alones before, most notably Tigana. The Android’s Dream reminded me why. It is completely self-contained, and has an incredibly fun, twisty, and satisfying ending. It reminded me of a Sanderson ending, with its complexity and unexpectedness, although I was able to call a few of the major twists a few pages before they happened. Four days to start, live, love, and finish an entire world. I really should read more stand-alone novels. In conclusion: The Android’s Dream by John Scalzi is a fast-paced, laugh-out-loud hilarious–even if it does occasionally stray into crude humor–stand-alone novel. It manages to make the humor utterly ridiculous and simultaneously integral to the completely serious plot. It’s one of the few novels I’ve read that portrays computer technology accurately, and it has a very twisty, satisfying ending. It blew me away. 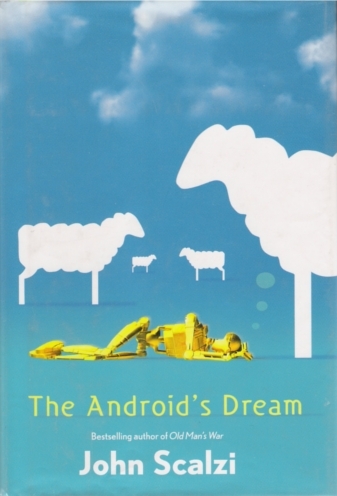 If you like brilliantly funny novels, and you want a quick, satisfying read, I highly recommend The Android’s Dream. Five of Five stars.